The Best Accessory For Your Imac! Home / Computers/technology / Gadgets / The Best Accessory For Your Imac! The way the iMac Clamp Hub fits onto the iMac is just so aesthetically pleasing. It makes use of a series of small slots running around the base – the speaker grill – to dock itself in a rather beautiful manner. The iMac-accessory gives you the one thing Apple couldn't... Accessibility. 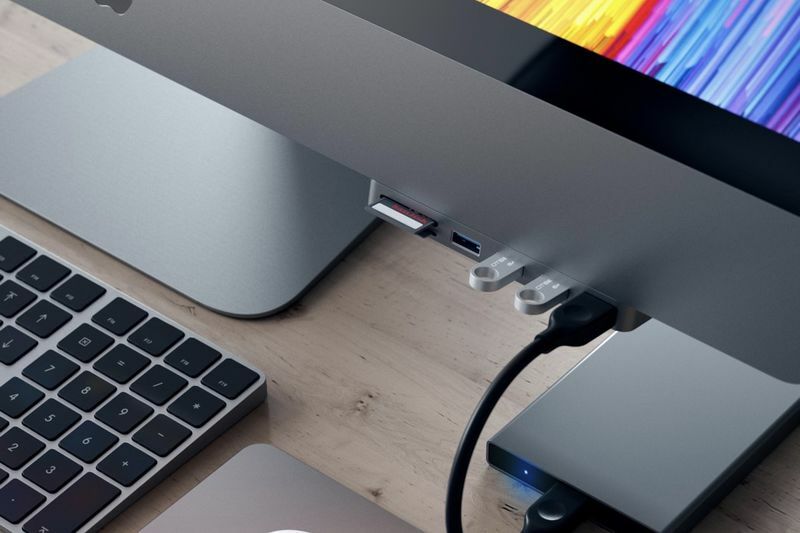 The device uses a Type-C jack and the iMac Clamp Hub connects to your desktop, instantly giving you 3 USB ports; a Type C port, and two card reader slots, which is an absolute blesser if you use your iMac for photography post-processing. The beauty of the Clamp Hub is the fact that it not only gives you more ports, it gives you more ports – duh – but it makes it easier to locate, so you do not fumble around to locate the jack-ports at the back of the iMac. Satechi even went to lengths to ensure that the hub matched the iMac perfectly in colour, material and finish, creating products that bring value to users. To set up the iMac Clamp Hub takes just a few seconds, using an adjustable knob, and its slim profile adds little visual bulk to the iMac. The iMac Clamp Hub is available for preorder from Satechi's website.